InSource exists to make manufacturers more productive & profitable. We provide scalable solutions that integrate technology with management systems and continuous improvement tools to ensure you achieve and then sustain success, however you define it. The world of modern manufacturing is complex. Our product & services offerings allow you to simplify it. Technology alone truly isn’t enough, however with our professional consulting, we make sure you’re getting the true value from technology. InSource Solutions partners with industrial hardware & software leaders to bring you solutions that deliver. Imagine unifying and arming control operators, maintenance personnel, IT professionals, plant managers and business executives with one common standardized source of real-time highly contextualized information. Couple that with collaboration and analysis tools to better understand the business, make better decisions, and drive the company to its fullest potential. InSource partners with software vendors that enables operational excellence across all industries, empowering customers with better insight into the economics of their operations, the basis for real-time performance management. Process Historian Design & Mgmt. Realizing the value hidden in your operations is the domain of Production Execution and Operations Management systems. It help to bridge the IT/OT gap, safeguard quality and improve operations performance by integrating all aspects of maintenance, production, quality control and inventory operations management in manufacturing. InSource partners with software vendors that enable clients to realize reduced operating costs by more than 50 percent, increased productivity by more than 15 percent, yield by more than 20 percent and have shortened time-to-decision by more than 80 percent. Our technology partners provide equipment that’s been rigorously tested, often regulated by laws and compliant with standards like IEEE, ASTM. This is the major difference between off-the-shelf technology & technology that is made for industrial processing and manufacturing. Our industrial computers and software offerings are designed & built for critical processes like Food & Beverage, Chemicals & Water / Wastewater. Taking a chance with IT architectures not built for industry can be costly, or even worse be fatal. 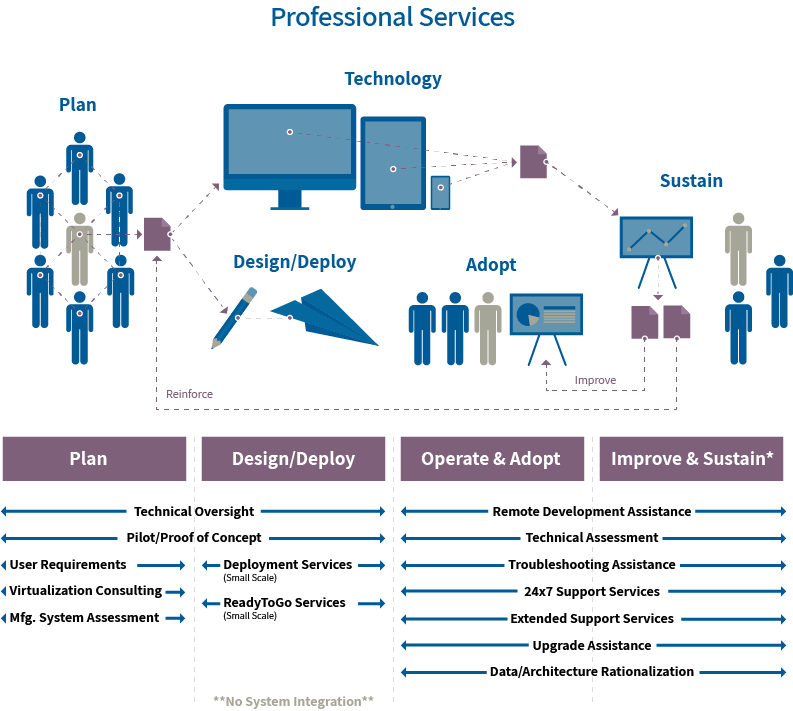 InSource offers professional services from the Planning cycle through the Sustain cycle. The chances of total success is increased dramatically by involving our team early in the cycle. Our experience, our methodologies, our perspective and our approach have been honed over time. Our services are selectively chosen to complement you, as the end-user, and other partners such as System Integrators or consultants working as part of the team. We do not compete with these teams. Rather we see ourselves as partners for mutual success. InSource does not do classical Control System Integration; we feel these are specialized services that our integration partners bring to the table. These services include PLC design and programming, Panel design, Electrical/Mechanical design, etc. If you, do not have a partner already chosen, we can introduce or recommend someone to you with a track record of success with project like yours. In order to have sustained results you need to consistently execute to operational standards. You have to have a defined set of standards, train to those standards, have the KPIs to drive those standards, have a process in place for corrective actions when you’re not hitting your goal, and then have a process to be proactive for improving the process. Simple, but not easy. It’s easy to fall into the trap of spending most of your time collecting data rather than analyzing the data, and sharing the data at team meetings and shift changes to make it actionable. Simply put, our System for Management allows you to take your plan operations to the next level through disciplined execution of a well conceived production strategy. Domain specific engagements that focus on setting a baseline for performance and moving to the next sustainable level while providing the tools and coaching so that our clients can be self-reliant. Our economy has evolved to a knowledge economy, where knowledge is used to generate tangible and intangible value. The term was popularized by Peter Drucker in 1969, shortly followed by the term knowledge-worker. In most cases if you are reading this, you are one of us – a knowledge-worker operating in our global knowledge economy. You spend considerable time looking for trusted sources of relevant knowledge to help you and your company gain the practical information it needs to achieve desired results and remain competitive.